Write short note on MMIC. Question: Write short note on MMIC. Monolithic Microwave Integrated Techniques i.e. MMIC is integrated circuit in which all the active and passive elements or components and connections between them are formed and processed simultaneously on a single substrate by some deposition technique as mentioned below. The MMIC fabrication techniques are diffusion, ion implantation, epitaxial growth, lithography, photo etching and deposition. MMIC fabrication involves choice of dielectric substrate material and fabrication process. These devices typically perform functions such as microwave mixing, power amplification, low-noise amplification, and high-frequency switching. Inputs and outputs on MMIC devices are frequently matched to a characteristic impedance of 50 ohms. Current generation of MMIC has gate lengths of 0.1 μm. Gate level of many MMICs is fabricated usually by electron beam lithography. There are 3 methods of making inductor in MMIC. Metal thickness in all 3 types is of several microns to reduce resistivity and minimize skin losses. Straight line inductors are used at highest frequencies but typically have too low inductance (< 1 nH). Since loop Ω inductors are easy to form but are limited in inductance to few nanohenries. Spiral inductor can be made up to 50 nH but requires two levels of metals with underpass. An air bridge process module is often in forming spiral inductors and elsewhere to minimize parasitic capacitance. A thick polymer such as photoresist is patterned, opening up holes to substrate. The openings must be large and polymer sidewalls must be well tapered. A thick layer is then deposited and polymer is dissolved. If the step coverage is adequate the metal will not lift during dissolution but rather would be left behind. 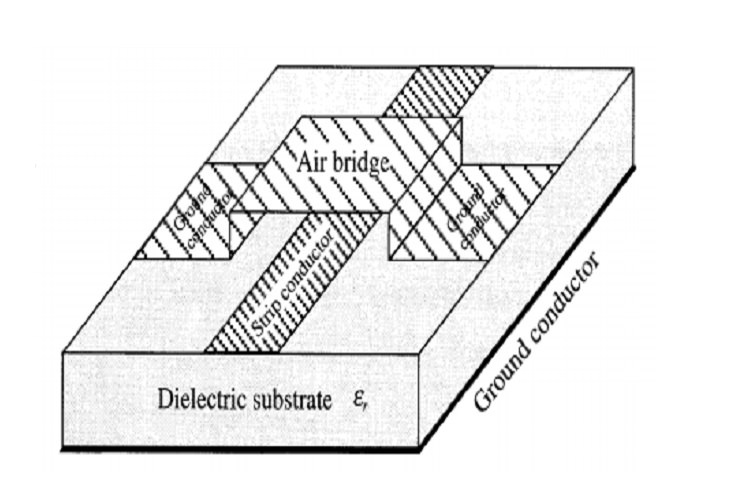 Air bridges have lowest possible dielectric coefficient. For small MMICs, gold air bridges are often formed because of gold’s low resistivity. Due to gold’s malleability, these structures require high density of support posts. Capacitors may be formed in two ways. Interdigitated capacitors can be formed on a single layer of metal but have very low capacitance (< 1 pF). Here the value of capacitance is determined by the lithographically defined spacing which is difficult to control. When a larger or more precisely controlled capacitance is required, an overlay capacitor can be used. Coplanar waveguide with parallel ground lines. Most commonly used dielectrics in an overlay capacitor are silicon nitride, silicon dioxide or polyamide. For interconnects it is necessary that lines must be well shielded and a stable ground voltage is provided. 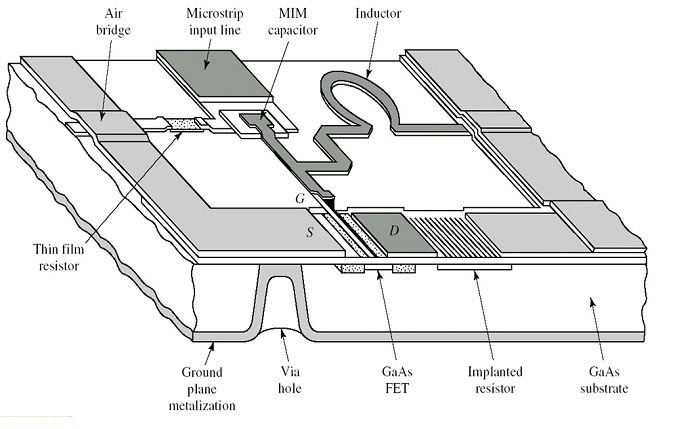 For fabricating MMIC interconnect, coplanar or microstrip waveguide can be used. Coplanar waveguide terminate field lines associated with parallel ground lines. Microstrip waveguide use the back of the wafer as ground plane.